If you have a cleaning requirement, ServiceMaster of Halifax Business Services has the solution. ServiceMaster of Halifax Business Services is a trustworthy and innovative commercial cleaning provider. Our customers can rely on our over 65 years of industry experience, extensive resources, research and development, innovation, consistent staff training and long-tenured employees. And we listen to your unique requirements and can provide a wide range of commercial cleaning services and pricing plans to suit your particular needs and budget. At ServiceMaster of Halifax Business Services, we not only provide outstanding janitorial, special facilities and hardfloor, we also offer a wide range of specialty commercial cleaning services, such as workstation, wood furniture, and so much more. If you need something in your commercial facility cleaned, make ServiceMaster of Halifax Business Servicesyour first call! Whether it is inventing new ways to effectively clean all areas of your office, or extending the life of your carpet and other floor surfaces, we understand the power of clean and maintaining a healthy work environment. At ServiceMaster of Halifax Business Services, we continue to work hard to be on the cutting edge of all technological practices, products and advancements in the industry. This is only one of the many keys to our success as a leading Canadian commercial cleaning company. People make promises to People; and People keep those promises. We have great customers, great managers and great associates. Even with rapidly changing demographics and workforce shortages in many industries, ServiceMaster Clean is an employer of choice in our industries because of our people focus. We work with commercial cleaning customers that really care about their facilities and have a long-term commitment to occupant comfort and productivity as well as asset performance and cost management. 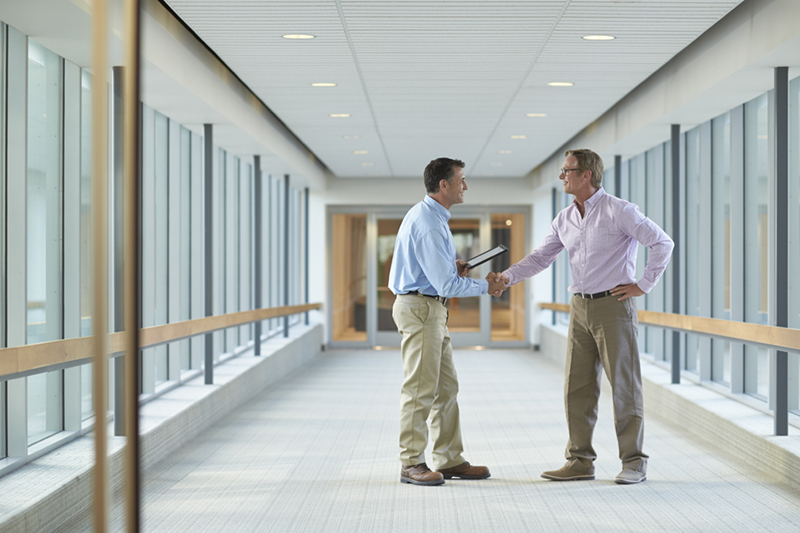 With a shared vision for facilities care with our Janitorial services customers we can design a service commitment and task plan to ensure that vision is achieved day in and day out. For Office Space Occupiers or Owner/Occupiers our Specialty Cleaning team can design a carpet cleaning, floor care and office furnishings maintenance program that will balance the needs of image, asset longevity and costs. We challenge our managers with networking, training and on-the-job problem-solving to ensure that the promises we make are kept. We are aware before our clients of new technology, trends and performance management approaches that incrementally or even dramatically improve cleaning services impact to the client. We lead. We serve. Our frontline personnel are people with families, goals and skills. We hire people that have a character of service and train the skills needed to excel for themselves and our clients. We provide the best ergonomic, labour-saving and efficient technology where we can so that our people give your people their very best every day. ServiceMaster of Halifax Business Services, utilizes the most advanced technologies to continually improve our service and our communication with our customers. At ServiceMaster of Halifax Business Services, we are committed to being our very best, so we regularly ask you to tell us how we are doing. Our TellServiceMaster® system, powered by Listen 360®, uses the latest technology to get your feedback on our performance. The system is designed so we can review individual customer feedback as well as our overall performance using the Net Promoter Score (NPS) system. ServiceLink® is a janitorial service inspection, communication and tracking system that ServiceMaster of Halifax Business Servicesprovides to our customers. ServiceLink uses the latest technology to provide effective quality control. The ServiceLink system allows you to track services performed by ServiceMaster Clean technicians and staff, and to simplify communication between our team and yours through email and text messaging, to enhance our service and the overall cleanliness of your facility.